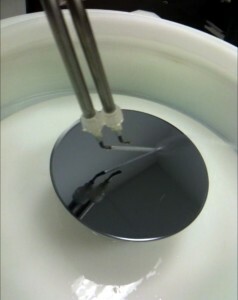 coating uniformity. Generally these materials are cast rather thick and +/-5% coating uniformity is considered good. The material can be deposited to “just” get to the edge by control of spin speed, acceleration and time. The edge bead is substantial and unavoidable, EBR is not recommended prior to bake since the solvents used (NMP) have a relatively low vapor pressure and remain “oily”. EBR will only have the effect of thinning the film and rendering it less uniform. Spin time has a greater effect on film thickness than does spin speed. The film outgases a substantial amount of vaporous material that must be disposed of. The material will condense on the cooler surfaces of the interior of the bake module. A properly designed bake module will dispose of the re-fluxable material in such a way as to obviate the possibility of reflux ON the wafer. If properly designed and built the bake module will never require cleaning and never create a defective wafer. As the cast films tend to be thick it is important to raise the bake temperature slowly by either using a series of hot plates or alternatively and perhaps more appropriately to simply ramp the temp of the wafer up very slowly permitting solvents to dissipate without creating film defects. Servo controlled lift pins perform this task admirably, it cannot be done with pneumatic control of lift pins. The develop solvent is best dispensed in an oblique stream since the contrast ratio is very high and the material does not so much dissolve in the develop as it forms a gel like material that needs to be “swept” away. While a spray will work a stream works better, faster and uses less solvent for that reason. Since the edge bead tends to be very thick, the develop process can be concentrated and directed at the edge of the wafer, reducing the edge bead without affecting the active devices areas inward from the edge. A number of S-Cubed Tool configurations are available that can handle the additional process requirements of Polyimide use. For production environment the S-Cubed Scene 12 with its meta-form archictecture adapts perfectly to the more precise requirements of spin control necessary to form a uniform patterned thickness barrier. The Scene 12 (and the S-Cubed Scene 8) have the additional advantage of allowing a multiplicity of spin bowls which allow for defect free backside processing in the same small form factor.